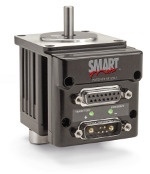 The SmartMotor™ and Combitronic Technology make the perfect pair. Learn more about SMI Interface. Download SMI at no cost using the SMI Download button above and use the installation wizard to install SMI, SMIEngine™ and coordinated motion. is a protocol that operates over a standard controller area network interface to help simplify multi-axis communications. Unlike other protocols, combitronc requires no single dedicated master to operate. Each SmartMotor™ connected to the same network communicates on equal footing, sharing all information, and processing resources. Learn more. High-end, high-speed processor for exceptional performanc. Easily access SmartMotor™ programmable autonomous control features in slave mode, which allows special user-programmed functions. See how this intellegent motor can help with your project. We're now on Instagram! Follow Us!